For the past four years of BARC’s The BI Survey, Phocas has had the highest proportion of customers that say they would recommend our business intelligence (BI) software to others. In the survey’s Recommend Key Performance Indicator (KPI), Phocas received a perfect score of 10 out of 10 in all three peer groups: data discovery-focused products, Americas-focused vendors and self-service reporting-focused products. The peer group averages were 7.5, 8.1 and 8.0, respectively. This is one of 30 KPIs in this year’s survey that illustrate how well Phocas performed against 36 of its peers. In this blog post, we will compare how Phocas performed against Yellowfin in The BI Survey 18 across several KPIs. In last year's BARC review blog post, we wrote about how Phocas compared against Yellowfin in Competitive Win Rate (6.9 to 3.1), Implementer Support (9.3 to 6.3) and Product Satisfaction (9.8 to 3.8). For 2018, Phocas once again outperformed Yellowfin in these KPIs, scoring 7.0 to 2.8 in Competitive Win Rate; 9.4 to 6.3 in Implementer Support and 9.5 to 7.1 in Product Satisfaction. For this post, we will highlight three additional KPIs: Vendor Support, Sales Experience and Mobile BI. Phocas’ subscription model provides training and support for no additional charge, and we have spent significant time and resources making sure that our customers can learn and master Phocas at their own pace. It’s also why Phocas received a score of 10 in the Ease of Use KPI and was top-ranked across all peer groups. Phocas was built from the ground up to be user-friendly, removing traditional barriers and bottlenecks to data analysis and reporting. Phocas understands that data is becoming critical to nearly everyone’s role, which means users of all skill levels can benefit from convenient access to BI combined with easy-to-understand, visual and interactive dashboards. In addition, Phocas has developed the Phocas Academy, which provides tutorial-style videos to get users started and comfortable with the software, and the PUG Forum where users can go to discuss Phocas with other users and share best practices. It’s the combination of intuitive technology and support services and tools that keeps Phocas at the top of the Vendor Support KPI. Oftentimes, how well the sales and purchasing experience goes is a direct correlation with how well the product will perform. The survey’s Sales Experience KPI is based on how survey respondents rate the sales and purchasing experience with the vendor. Phocas received the highest score in the data discovery-focused products group and is a leader in the Americas-focused vendors. Phocas scored a 9.6 in this KPI. Yellowfin scored an 8.9. This is the goal from our first interaction with prospective customers and how our sales, implementation and customer engagement are organized for their success. Just as Phocas was made to be user-friendly, it was also built with the understanding that today’s workforce is mobile. People need tools that allow them the flexibility to work as productively on the go as they can at the office. Whether you’re in sales, warehouse management or executive management, you need to monitor the pulse of your business, and that requires that you can take your technology and data with you. The Mobile BI KPI is based on how many survey respondents currently use their BI solution on a mobile device. Phocas received a 9.3 while Yellowfin scored a 5.7. Phocas was the top-ranked solution in the data discovery-focused products peer group, and a leader in both Americas-focused vendors and self-service reporting-focused products peer groups. Many business decisions need to be made quickly and collaboratively, which is why users need analytics at their fingertips. Customers’ needs can be addressed faster, challenges can be replaced with opportunities and answers to strategic questions can be made intelligently rather than based on gut feel. Mobile BI is no longer a luxury; rather it is an expectation from companies that need to react quickly to customer needs, competitive pressures, and the ebbs and flows of their industry. 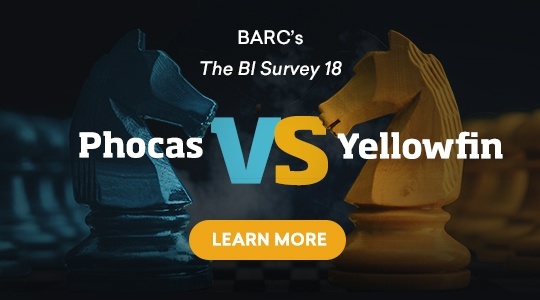 For a more comprehensive review of how Phocas compared to Yellowfin in The BI Survey 18, download the Phocas highlights document.